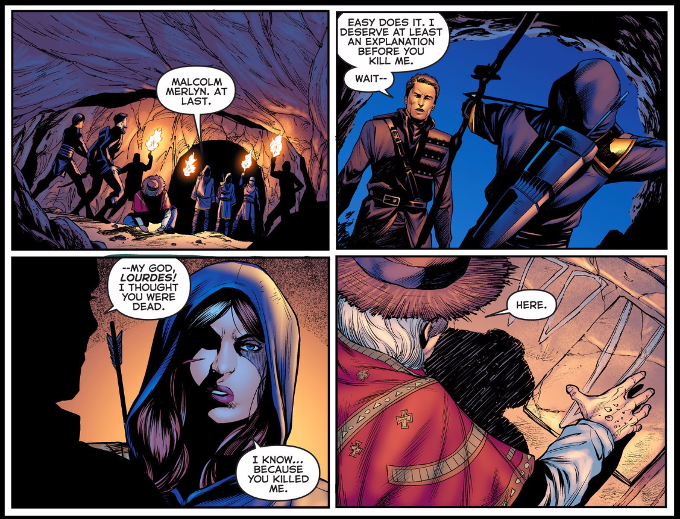 The chase continues as Malcolm Merlyn flees into the ancient catacombs underneath his secret mountain lair. His mysterious enemies are in hot pursuit. But will the dangers of the ancient caverns claim them all? The action is hot and heavy in this third chapter of The Dark Archer but explanations are few and far between. John and Carole E. Barrowman have thrown out a lot of information but very little of it has paid off. Indeed, we don't discover whether or not Merlyn knows the woman leading the forces that are trying to kill him until nearly the end of the issue. Even then, we don't know anything about their relationship. This wouldn't be so bad in a weekly title, but the story so far is dragging a bit for a series that is published bi-monthly. Thankfully, the artwork continues to be as impressive as ever. Daniel Sampere does a fine job choreographing all of the action in his artwork. Juan Albarran finds the perfect balance between simple highlighting and enhancing the original art with his inks. And Kyle Ritter's color palettes are well chosen, denoting heat and warmth with amazing subtlety.